Upon opening the book, the first thing I saw were the individual plates separated from the rest of the book. I felt each portrait was telling a story of specific people while also bringing out the commonalities of these Chicano individuals. My first question is how you decided to separate these plates from the rest? Do they each remind you of a story or friend? Additionally, do you have a favorite among these and, if so, which is it? When I started sharing the manuscript with friends they often asked before sending back their comments if they could keep an image or two to frame. I was so grateful for their feedback that I was more than happy to share what, to me, were just color copies. It placed a seed in my mind, though: the desire on the part of reader to take something away, something tangible, and my desire, as the creator of this work, to share something tangible with them as a form of appreciation. They took the time to read through my work, sharing an image or two was the least I could do. I also grew up with a series of books called the Metropolitan Seminars in Art, and inside every front cover was an envelope containing images of the artworks to be discussed in the interior essays. It gave the reader/viewer the opportunity to hold the image, move around with it, and to spend time with it in a different way than you can with an image in a book. You could also hang up the images, which is what I did in my apartment during graduate school. When I started discussing design ideas with Stephanie Sauer at Copilot Press, I mentioned to her both experiences. Copilot specializes in ways of combining text and images, as well as creating an experience for the reader, a different way of engaging the material. So Stephanie ordered a few of the Metropolitan Seminars in Art, and set about creating a format to include removable prints. The fact that the prints are the first thing a reader encounters upon opening Letters to the Poet from His Brother indicates that this book is going to be something different. As far as the selection of the ten prints, I wanted the work to be representative of what would be found inside, so we picked a few from each series. I also chose those that had resonated strongly with viewers over the years. Again, thinking, “Which images would someone want to hang on the wall or give to a friend?” When I look at the ten prints together, I don’t necessarily think of the stories told in each one, I think of the years, the time in my life that those paintings chart. I remember where I was when I painted it, what I was thinking, what I was hoping for; looking at my own work is like thumbing through an old journal. For that reason, I don’t have a favorite, I look at them nostalgically, or sentimentally, maybe even with a certain degree of embarrassment. Others have said this in different iterations, but my favorite work is always in the future. Do you believe that art as a whole should represent real life, or is it a personal goal to give faces and voices to the Chicano population? I see everything in this book as personal. That it deals with larger political issues or overarching concepts of art and its purpose are because these are issues that define me, that either move me to create or frustrate me, often both at the same time. But I only feel comfortable speaking for myself. The reason I included dates on several of the essays in the section, “The Chicano Artist,” was because I wanted to show a progression, an evolution in my thinking. The same questions remain throughout – What is the Chicano artist’s role? What is my role as an artist? – but whereas in 2004, when I wrote “Letter to the Art Critic,” the voice is more hopeful and idealistic, maybe even a little naïve, that changes by the time I’m writing “Conversation Between a Father and Son” in 2008. By then, the artist is more cynical about that earlier idealism; he questions it intellectually, yet he is unable to let it go because he realizes that this idealism is intrinsic to his being. I paint and write about what moves me, and often I draw from real life, my own experiences or the experiences of those around me, but I also freely utilize the license to invent. The paintings in the series “Cantos of Sorrow” are all based on memories, but the characters in the paintings are entirely from my imagination. To be chained to “real life” would be limiting. I insist on the freedom to push my work in whatever direction it takes me. At the same time, Chicana and Chicano stories are still so rarely told, their faces so rarely depicted, that there’s still this great need. We see it in the voices of early Chicano and later Chicana writings, “If we’re not telling our stories, who will?” On the one hand, it’s sad that we still must ask that question; on the other, it’s an important responsibility, the choice between visibility and invisibility. As artists, we should want the stakes to be that high. Who is the intended audience for your books and paintings? Do you want to speak to people like Mr. Saltz, to the general public, or to the artistic community? Like most artists, I believe that my work is universal. What moves me I hope moves others. But when I was getting my MFA in visual art, I remember becoming so frustrated during my peers’ studio critiques because although I respected their devotion to their craft I didn’t understand what motivated them to create; I didn’t get the formal or conceptual rules they played by. I kept insisting on meaning defined by emotion, by my heart and by my gut, but for most of them that was too elemental. Gloria Anzaldúa wrote how the academy’s distain for anything “simple, direct, or immediate” is a way of silencing the stories we want to tell. I see myself first and foremost as a storyteller, so immediacy will always be important, yet I also acknowledge that one of the reasons I feel so fortunate to work in different mediums is the flexibility to operate on different levels. Perhaps the written word will reach a reader where the visual image does not, or vice versa. In “Letters to the Artist from His Son”, you talk about the difficulty of defining the “Chicano” identity. Do you think there is one true definition or description of what it means to be Chicano? Or is accepting this Chicano identity different for each individual? Most importantly, how would you define yourself as a Chicano, or what do you think this identity could ultimately mean? I teach in the Chicana/o Studies Department at UC Davis and I always begin my classes with an open definition of Chicano. This can be frustrating for my students. Partly, they seek a strict definition because that’s how we’re conditioned, but maybe they’re also looking for a way of deciding once and for all whether to accept the identity or reject it. They could also simply feel as if I’m beating around the bush. Either way, I’m being an honest when I encourage an open, flexible definition of Chicano. No one person owns the term or identity, which allows for it to evolve, and where it has ultimately derived its power. So, to answer your question: I don’t think there is one true definition or description of what it means to be Chicano, and yes, accepting a Chicano identity is different for each individual. But what binds us is the fact that we’re confronting ourselves – our history, our identity, our negotiations of the in between, our resulting confusions and insecurities, but also the fruitfulness of those negotiations – and doing so directly. The reason it’s easier to identify as Mexican-American or Hispanic or Latino is because what do any of those terms say about how one experiences the world. Chicano is putting a name to experience and that’s what makes it so complicated, at times problematic, but also so rich. The section “Cielo Rojo” was structured completely different than the rest of the book and contained portraits and paintings as well as a short story. I also noticed the reference of the title in the song “Cielo Rojo” by Juan Záizar. Can you comment on the inspiration behind this specific section, as well as the connection between the story and portraits to the actual song? In summer 2008, I was working on a mural with junior high and high school students. After the students left for the day, I continued painting. After a while, I noticed that a man had driven up to the wall, got out of his car, and was waiting to speak with me. When I stopped painting, the man asked without any explanation, “¿Cuánto me cobras?” – how much would I charge him? When I asked “for what?” he proceeded to describe all the things that were going wrong in his life – he had injured his back, he had lost his job, his wife and children were pressuring him. I included most of what he told me in the narrative poem. He would occasionally pause and then ask again, “¿Cuánto me cobras?” When I ‘d ask again “for what?” he’d launch into another litany of hardships. Finally after about ten minutes, the paint drying on my palette and brush, I pushed him to answer what exactly he wanted, and he answered: “How much will you charge me to express what I feel right here?” And as he said this, he pointed to just above his stomach and below his chest, as if that was where he located all of his stress, his frustration, and his disappointment. Afterward, to be honest, I chuckled to myself at the exchange, his request seemed so absurd, but I also couldn’t let it go. I kept thinking about his desperation and his belief that I was the one who could represent what he was feeling, and not only that, how there was this need for him to express it, or rather, for him to see it expressed. At the time, I was working on the series of portraits and landscapes that became “Ciejo Rojo.” I was just working through the process, enjoying the aesthetic of the black-and-white drawings/paintings on a red background, but suddenly in all those faces, and in all those empty landscapes, I started to hear the man’s words – “How much will you charge me to express what I feel right here?” – each face, each empty landscape had a story, each one wanted it told, and it was up to me, the artist, to tell it. I didn’t seek that man out, he found me. I had a choice, of course, whether or not to tell his story, but maybe I didn’t. I couldn’t let it go. To this day, I can’t. As far as the song “Cielo Rojo,” during this period I was listening to the version sung by Miguel Aceves Mejía, and I loved its haunting quality. I can listen to a song a hundred times and not bother to listen to, or, as in this case, translate the lyrics, but one day I paid closer attention and heard the line about the man dreaming that he’s heading toward a blue sky but awakes and discovers that the sky is red, and suddenly it hit me: the red background in my paintings, the man who approached me at the mural and his realization that none of his hopes and dreams had panned out and most likely never would; that, for so many, the sky is red and always will be. I wanted to bring it all together. I started writing the narrative poem shortly after. I thought that your essay “Conversations between a Father and Son” was particularly interesting because it demonstrates the different approaches both you and your father took in documenting Chicano history through art. Considering the strong dedication you and your father have to Chicano art I want to know: do Chicano artists have a certain responsibility to document Chicano history? In essence, can a Chicano artist or author create landscapes or write books not related to the socio-economic struggles or cultural celebration of Chicano people? Or could this be seen as assimilating into American or main-stream culture? I think less in terms of “responsibility” and more in terms of “honesty.” Responsibility has the ring of convention or tradition and artists either instinctively (or are taught to) buck those. Artists must be honest with or authentic to themselves. If they’re not, the work is merely an imitation of something else. What moves you to create is what moves you to create, and worrying about how and where it fits can be crippling. As has been said before, there isn’t one Chicano identity, only Chicano identities, and the art emerging from that experience should reflect that range. So no, it doesn’t have to be explicitly about socio-economic struggle or cultural celebration. At the same time, Chicano artists (whether self-identified or not) must be aware of all forms of outside pressure, including those placed on us by contemporary fads or graduate programs. I felt very alone in my MFA visual art program. I thought that no one understood my work (a common feeling, believe me, and not exclusive to Chicano artists), and I felt immense pressure to adapt my work to something that was more accessible or understood or liked by my mostly white teachers and peers, or the commercial galleries just outside our doors. We must ask ourselves: how many visual artists have gone through MFA programs and had a mentor encouraging them to make art seeking social change, or art that was relevant to their community, or art that spoke directly to the heart of their identity and experience? I would guess very few. More often than not we find mentors encouraging us, at best, to be subtler (usually for the sake of subtlety) or, at worst, to take our work in the opposite direction. What impact does that have on our visual production? I also want to be clear that I’m speaking about visual art. I could be wrong about this, but for writers, the maxim “write what you know” tethers us to our experience in a way that’s just not expected of visual artists. I want to add one last thing. My first semester at Columbia was a dark one. I mean, dark. I felt like I was starting to lose my instincts as an artist. I had so many voices in my head that I had trouble locating my own. I had never experienced that before. Maybe it was good to have gone through that, to know what it’s like to create when the ground has been removed from beneath you. But late in the semester, I had a chance studio visit with the Chilean conceptual artist Alfredo Jaar. He looked at my paintings in progress, he flipped through a binder of printouts of past work, and afterward, he said to me a variation of this: “Don’t listen to a thing they tell you in this place. They won’t understand what you’re doing or trying to say. 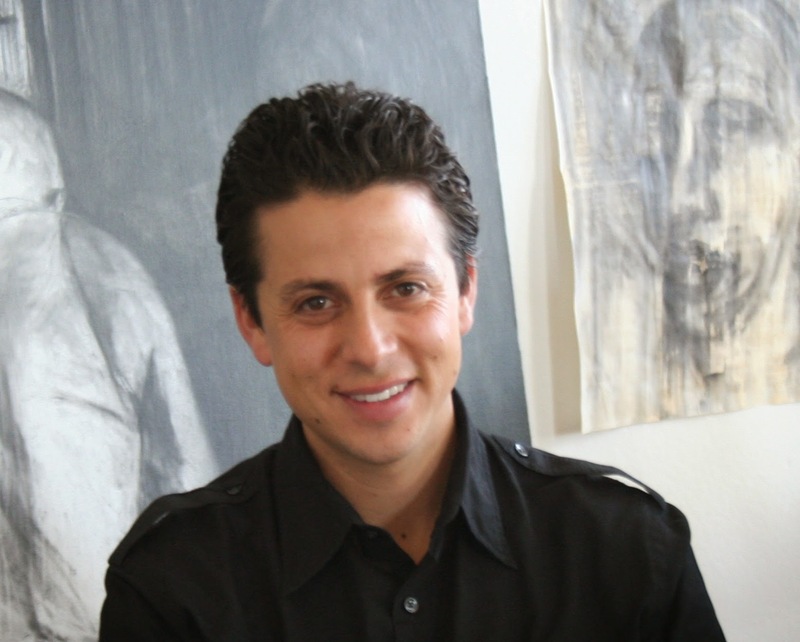 Get through here, make the necessary connections, but keep making this work.” In an instant, he had validated the tradition I was working in (he may not have known extensively about Chicano Art, but he was certainly aware of long histories of socially-engaged art), and he had restored my confidence. I set about slowly regaining my instincts, and I’m forever grateful for his words. I had my dad telling me the same thing, my artist friend Carlos Jackson, too, but I couldn’t hear them – or I had heard them so many times before that their words could no longer reach me – but Alfredo Jaar, he was of that place, of the “art world,” yet he knew what I was going through. It was just a small nudge, but it was everything. I was fortunate, but it makes me wonder how many Mexican-American or Latino or self-identified Chicano artists enter these institutions, lose their instincts, and then must rebuild completely alone. It’s a vulnerable position to be in. All of the paintings were beautiful, but I truly loved the profiles of the different people throughout the course of the book. In each of the faces I was able to hear a story and feel the emotions conveyed. Of the numerous paintings included in your book, which one do you believe or hope to believe will resonate most with your readers? Plus, if you could pick one word to encapsulate the specific painting, what would it be and why? I agree with you that just a simple rendering of a face contains a story and emotions that can’t be articulated any other way. It’s hard to single out just one painting as representative. I like having a range of styles in my work – from the large almost operatic black-and-white compositions in the “Cantos of Sorrow” series to the quieter moments in the “Inmensidad” series – and I imagine viewers will be drawn to different images for different reasons. One thing I’d like to mention (or confess) is that to get the shadows and highlights just right in my work, I often take photos of myself posing as the figures in the painting. So somewhere in my photo library there’s an image of me on my deathbed, another as an old woman reading the bible, and another as a fieldworker with a Pumas hat and pañuelo. It’s just a tool to help me in the painting process, but I think there’s something there: this idea that all of these faces and stories are me, or are inside me, and that for all my outward-looking gaze, the process of painting is, in fact, an excavation of myself. After reading “The Last Letter” and seeing the last painting, I felt as though you were finally coming to peace with the passing of your brother. That being said, do you think that perhaps creating this book was necessary for your healing process, or a result of it? When I finished this book, or when with the help of Copilot Press I saw what this book had become – this beautiful object containing roughly the last ten years of my life – I definitely had the feeling that a chapter had closed. Whether it was the process of finding my voice as an artist, or coming to terms with my father’s legacy or my brother’s death, or how I had carried Andrés’s loss around with me for so long and wielded the grief as a tool in my own creative process, I felt that this book had placed it all in the past. And for a while I was struck with certain doubts: What do I create now? What do I draw upon now? To this day, I enter the studio and struggle to answer these questions. In writing my narrative, encapsulating it, placing distance between myself and the narrative I’d constructed about myself enough to name it, have I become only too aware that moving forward I must chart a new path or else risk repetition or self-mimicry? I don’t know. I want to say that there’s never peace. Or maybe I fear peace just as I fear remaining stagnant. I sought answers in writing this book but that’s not to say I found them. You asked about healing from my brother’s death and here I respond with how it has affected me creatively. Perhaps that’s evidence that I’m still the same person after this book as I was before. When I was little, Andrés used to play rough with me and he didn’t care that he had such a size advantage, and often I’d end up hurt, and yes, crying, and I’d go immediately to my parents and tattle on him. I remember how he’d look at me afterward, as if I had betrayed him so deeply that maybe he would never forgive me. As I’m writing this, I imagine him looking at me now just like that. For me, reading Letters to the Poet from His Brother was similar to reading a new story in every painting, recollection, and essay. I want to know how different it was to write this book compared to your previous novels. Did you have a vague plot line outlined in your head? Was there a focus on the interpersonal relationships? On the other hand, I’d also like to know how writing this book was similar to writing a novel. I couldn’t have written this book all at once. I pieced together writings over the years, and then I stepped back and asked myself, “What do I have?” I didn’t exactly know. I saw that I was talking a lot about Andrés, about my dad, about Chicano Art, about the role of the artist, but I didn’t know what they all had to do with one another except that they emerged from within me. It really wasn’t until I shared the manuscript with a few friends, including Tim Z. Hernandez, David Dominguez, and Manuel Paul Lopez, and later, Bidisha Banerjee, and heard their feedback that I realized what I had. It was Tim who first referred to it as a memoir. That struck me because I honestly hadn’t thought about it in that way. In fact, if I had I probably would’ve abandoned the project. As a fiction writer, I prefer screens between my stories and myself. But once I came around to that label, and admitted, okay, you’re talking about yourself here, you’re the center, I was then able to move on to how I constructed that narrative; what I needed to add to round out sections, what I left in or took out, and how I went about creating a through-line or arc. In that sense, I found my footing as a novelist – I wanted the reader to feel that there was a progression, that something was building. Admittedly, it’s not a very long work, but so many people have told me that they read it one sitting, unable to put it down. From a collection of disparate writings to a page-turner – the novelist in me is satisfied. In fact, the day after the book release party (and celebrating until well into the morning), the poet Javier O. Huerta, sat on my front porch swing and read the book while soaking his feet in a tub of water. Poets Laurie Ann Guerrero and Joseph Rios were there, too. Joseph was actually in the driveway dismantling my old truck for parts. Anyway, two hours later, Javier closed the book and then sent me a text message despite the fact that I was five feet away nursing my hangover. It said, “Just finished Letters. Good job.” My head hurt a little less after that. Maybe that’s my novelist preoccupation, I just want to know whether you made it all the way through to the end.